Susan Sheehan of Flaming Hot! asks how much time the business end takes us versus how much time creating material. In my case, and in many others, one has to add time on a full-time job. What do I do on the business end? Display, record keeping and promotional activities are the main categories here. I have to take and edit pictures; I need to maintain good inventory and sales records, and I need to promote via networking sites, image galleries, and blogs on the Net, and also promote in brick and mortar venues. In addition I need to work full-time and find creation time ... but I also need to carve out time that is neither work nor production, in order to recharge. How much time? In some ways, it is hard to know. Liz Davenport, in Order from Chaos, suggest that there is only now. (However, there's also "pending"). I practice that--I say practice, because I fall flat now and then. Okay, a lot. I take photos. If I can, I edit them then. If not, I edit them as I post on ETSY. As I post, I enter each set or focal into my Open Office Spreadsheet (a work in progress, but I am happy to share it!). It automates some of the repetitive entries and allows me to generate an invoice without retyping data or much cut and paste, and I will be happy to share the basic template. Increasingly, though, I think a relational database will further simplify data records. Whatever way works, it only functions as a time saver if I enter data as I list it on the website or on ETSY, and at point of sale. Five minutes versus hours at monthly tax-time is a major time savings! Promotional activities go in "Pending," and I schedule time for them. Mostly; I'm squeezing this into cleaning up time! Blogs and Flicker can "fit into" my work day, but that means that they are not consistent. My best success is to post on Flickr and this blog as I list items -- as part of record keeping -- and to update other galleries, such as Bead artists.orgT and Talent DatabaseT, once every two weeks or so. I leave cards at places I visit regularly. I am still working out that rhythm. It still adds hours ... ten minutes and five minutes and half an hour add up! Part of the reason for "doing it now" in five to ten minute bursts is my full-time job. I teach history to adult students returning to school, taking night classes. The up-side to my job is that it is flexible. Currently, for example, I am sitting in my office, ready to register my advisees for their fall classes. Business has been steady enough that reading something and making notes on it is really not an option, but posting a fast blog post, editing FLICKR titles, and the like -- things I can pick up and put down in five minutes -- are possible. I can also work much of the week and Saturday and take off a Thursday to torch without interruptions, or arrange my schedule in other ways. The downside to my job is that flexibility has limits. Class time, committee work, faculty meetings, and office hours are not flexible, and if I am teaching a new class or writing an article preparation will take priority over everything. Overall, the time I spend fluctuates. I try to regularize and almost automate most tasks -- this blog appears on my website, which means that new listings show up there regularly, too. But my "behind the scenes work" is like the rest of my life: in seasons. Some things are daily, or as daily as I can make them: ETSY listings and sales records. Some things are monthly: secondary web posts, brick-and-mortar card refreshing vists. Some things take precedence at some times of the year. ANd doing things as they arise is the key to my sanity. So far. Ask me tomorrow and my system may be different, because my rhythm will have changed. I support my friend Jenn in her efforts to raise money for the Cystic Fibrosis Foundation, becuase her own daughter Cassidy has CF. 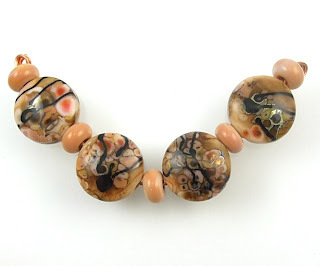 To help out, I have donated lampwork jewelry to her online auctions, which you can find by clicking this link. Everything is hand made, and 100% of the donation goes to the Cystic Fibrosis Foundation. I have also added direct links to every auction, below. In addition, from April 17-April 20, in conjunction with the Etsy Supplies Street Team, I have a 20% discount on everything in my ETSY store for people who donate to the Cystic Fibrosis Foundation through Team Cassiebug. You can donate by following this link! It doesn't have to be much--give what you can spare--even $1 is better than $0. Then give me your donation info in a convo or email labelled TEAM CASSIEBUG, and I will revise your invoice or, if you have already paid, refund 20% of your purchases. If you want, pay full price and tell me it is for Team Cassiebug, and I will donate 20% of your sale in the name of all the Etsy customers. So here's your opportunity to get wonderful handmade unique beads at a discount, pick up some lovely handcrafted items, and do good in the world, all at once! Thank you for your time, your bandwidth, and for looking! Together -- let's find a cure for Cystic Fibrosis. I am having a sale in my ETSY store this weekend -- 20% off everything ONLY for people who donate through Team Cassiebug! Just give me your donation info in a convo or email labelled TEAM CASSIEBUG, and I will revise your invoice or, if you have already paid, refund 20% of your purchases. Violets are beautiful flowers, delicate yet colorful. My yard is a carpet of wild violet, which I think would send many gardeners into a fit of hysteria. Generally I just mow them; they stand in nicely for grass and are highly drought tolerant, important right now when despite our recent rains we are still at a level-four drought. In my woodland flower bed, however, I do not want violets. When I first planned the bed, I read about a foolproof method for suppressing weeds--a thick layer of newspaper covered with compost or pine straw. I duly hied myself to the Farmers' Market and its industrial bins of newspaper recycling, and came home with arm-loads of the New York Times and the Wall Street Journal. (They have fewer glossy inserts and a higher print-to-colored-ad ratio.) I spread my paper, and covered it with pine straw, and happily, blissfully waited out the winter. Such winter as we have in Atlanta. However ... I had used too thin a layer of newspaper; while the paper was suppressing many of the weeds, it was no match for the powerful invasive, determined wild violet. The area where that bed is had been hard-packed clay under a garden shed, judging by the soil and the concrete-lined post holes. That means that violets are almost impossible to pull out unless the ground has been soaked. It rained last night, so this afternoon I armed myself with a trowel and some buckets and tackled the bed. I got about third of the thickest nest of violets out, but still have a lot to dig. Oh, well. It is good fun; I had Piglet out in the yard with me, and I sang silly versions of folk songs to him (What will we do with a barking Piglet erlai in the morning? Yes I should have laid more paper, yes I should have weeded sooner, DANG, I should have laid more paper erlai in the springtime ... ) At least it was until my back complained. I would never have made it as a farmer. 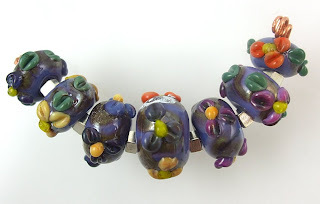 Meanwhile, I just listed some purple floral doughnut beads on ETSY, in honor of the violets. Yes, the violets are in a sack, so they cannot root anywhere else, bless their nasty little plant hearts. "The first set of auctions to benefit the CF Foundation is ending TODAY and most of the stuff is going very, very cheap. Nip on over if you haven't and take a look, consider picking something up - all proceeds are going to a great cause! Please help out Team Cassiebug and help find a cure for CF! You can find them here! The second set of auctions will be up on Saturday (4/12)." Right here! Simple frit beads are transformed by a simple intense black accent into the look of Japanese stoneware. Elegant with summer whites, superb with winter blacks. Meanwhile, it's been a busy (if wonderful!) weekend, but I get to torch today after I run errands. Wheeee! We had a fantastic time! Gwacie and Dogmaw hit it off instantly, and the four of us--me, Gwacie, Dogmaw, and Frostfire--all had a lovely time at the show. I think we all did well, and Gwacie gave me some tips that I just hadn't thought of about lighting, backgrounds, and timing. She has a lot of experience, and I am always happy to get suggestions by people who have experience. At home, even my shyest cats came out, as both Dogmaw and Gwacie are animal lovers. Of course, the cats made a beeline for the person who was allergic to them :) What can I say? They are cats. And all hail Supermomma, who made me a spectacular card holder that garnered a lot of attention. I'll talk more about it tomorrow and add a picture. I handed out a lot of her cards, too--it is hard to impress glass people, and her work did. Meanwhile, I have a new ETSY listing! Other listings have changed somewhat, because many people wanted only two or three beads from each set. So check back and see what's new and improved! Huzzah! Art of the Firebird and I are going to be at the Down the Street Bead Show on Saturday, April 5, and Sunday, April 6, at the Cobb Galleria in Marietta, Georgia. If you're going to be in the Atlanta Metro area on that weekend, I'd love for you to stop by and see us! Meanwhile, if you are interested in an excellent display of beads and beadmaking tools (if I do say so myself), check out the Southern Flames display at the Swilley Library at Mercer University. First the good news. Click the link and spread the word! Team Cassiebug auctions now live on Ebay! Collectibles, BPAL, handicrafts and more! All proceeds benefit the Cystic Fibrosis Foundation. Meanwhile, Gwacie arrived last night. After a dinner of excellent Vietnamese pho, we talked beads, dogs, beads, family, beads, glass, and beads. 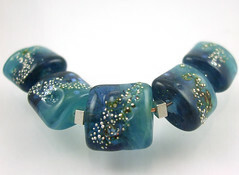 Today is torch time, and tomorrow we will both be at the Down The Street Bead Show at the Cobb Galleria. Art of the Firebird and I usually share tables, as we both work full-time and neither of us can fill a table alone, and Gwacie will be at the next booth, ably assisted by the fabulous Dogmaw. If you are in the Atlanta area, come visit!